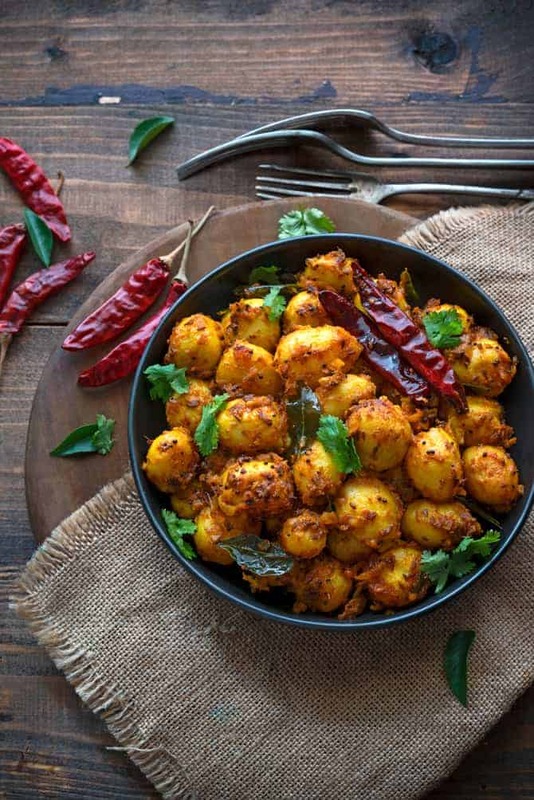 Spicy Masala Baby Potatoes Recipe – is a quick and aboslutely delicious dry preparation of boiled baby potato tossed in chilli based masala along with tamarind pulp and freshly ground spices. This gluten free and vegan 15 minutes spicy baby potatoes roast recipe, is exactly what you need to pamper yourself on lazy weekends. Either as starter or as a side dish, this easy baby potato roast will make you crave it very often. Potatoes always comes to the rescue when we have no other vegetables or greens available with us. This versatile tuber picks up lovely flavours of spices or any other veggies when cooked with. Potatoes at my home have consistently been a family favourite. This spicy baby potatoes are ready in under less then 15 minutes, if you already have boiled potatoes stocked before hand. Do you love potatoes? Then this recipe is all for you. That spicy masala coats how beautifully to the baby potatoes fry. 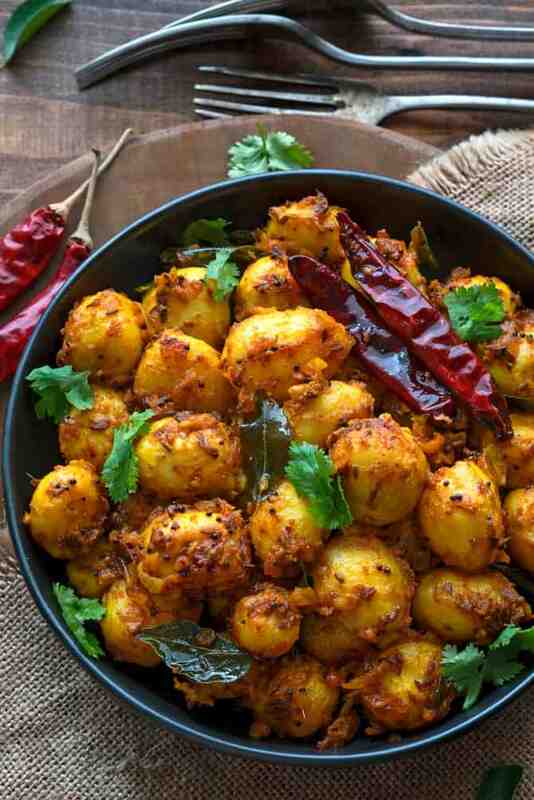 Every bit of this masala baby potato roast will drive you to that tickling spice heaven. Oh, I have to tell you, this dry spicy baby potatoes recipe serves the purpose of both, appetizer or starters as well as main course. You can serve the roasted baby potatoes with chapati, hot puris, parathas. Usually, I love to have hot dal rice topped with ghee and baby potatoes on the side, sheer bliss! what a perfect sunday meal, you have then 🙂 . 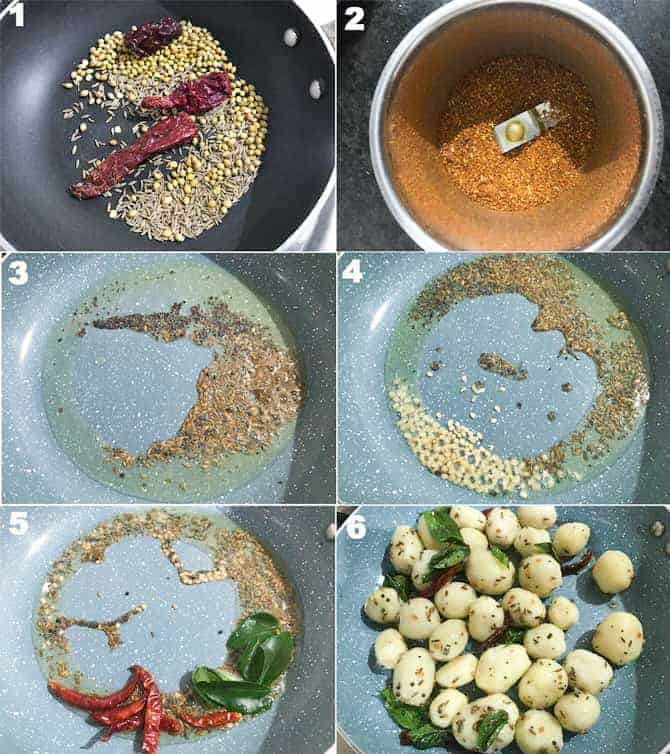 Do add this recipe to your Indian weekly meal plan list also. The spicy baby potatoes roast has always been my husband’s favourite, he like to gobble it as it is like a snack. The freshly ground masala when combined with tempered curry leaves, mustard, cumin seeds, the flavour picked up by these tiny beauties is utterly enticing. What do we need to make roasted baby potatoes? And so, they are regular affair at our table. You have to try this out and I bet you will go crazy once you eat this. So, without wasting time, let’s head on to see how to make this quick and super tasty spicy baby potatoes in minutes. 💓 We Love to hear back from you and appreciate your success stories ! 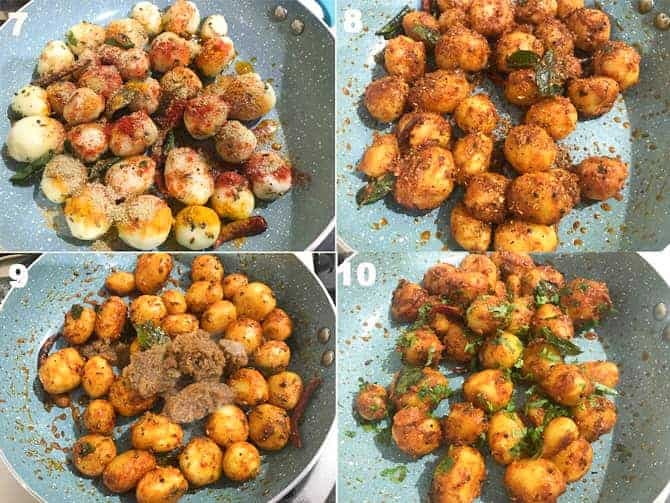 Have you tried this “Masala Roast Baby Potatoes Recipe“? Please feed us with your ★ star ratings and comments below. 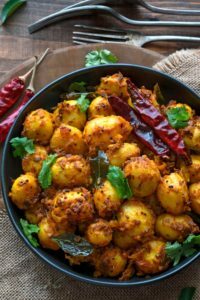 The 15 minutes spicy baby potatoes recipe is a simple and quick delicious boiled baby potatoes tossed in chilli based masala along with tamarind pulp and freshly ground spices. This gluten free and vegan masala baby potato roast recipe, is exactly what you need to pamper yourself on lazy weekends. Dry roast the coriander seeds, cumin seeds and whole red chillies in a pan. Add mustard seeds and cumin seeds, allow it to crackle. Finally add coriander leaves and toss. Spicy baby potatoes are ready to serve. Tried this recipe?Tag @cubesnjuliennes on Instagram	and hashtag it #cubesnjuliennes! Green Pea Soup with Spinach – It’s Vegan, Gluten free, Dairy free! so much relishing this looks. I am trying this right now!!! They are so delicious and perfectly spiced. Tried them today and just fell in love with it.